Jane Coleman has been with this firm since 1980. As the firm's sole employee for many years, Jane has acquired a great deal of experience in many areas. 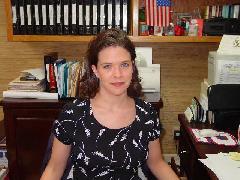 She applies her skills as a legal assistant in the areas of real estate, creditor bankruptcy and client relations. Jane is a member of her church handbell choir and is active in community theater. She also enjoys playing bridge and traveling with her husband and grandson. Melissa Hartley has over eight years experience as a legal assistant. Her primary areas of responsibility are real estate, probate and commercial litigation. Melissa enjoys reading and playing golf with her husband.